Upon arrival at Bangkok airport meet our representative at meeting area out side custom area. Transfer to pre booked Hotel in Phuket. Please note that normal check in time is 1400 Hours. Early check is on request subject room availability. Check in to pre booked hotel. Day at rest. Lunch and dinner at the nearest Indian restaurant. Day at your own. P.M free at your own. 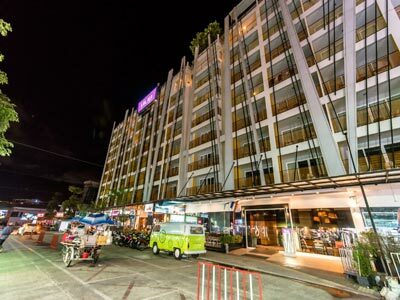 Ashlee Hub Hotel Patong conveniently located on Phuket’s dramatic West coast and conveniently located in the heart of the popular tourist town of Patong, this newly-built eight storey hotel overlooks the magnificent Andaman Sea. Perfectly suitable for guests of all ages, each contemporarily designed room delivers sheer comfort with a choice of king and twin-bed and an additional full size sofa bed. All rooms feature total living space of up to 42 square meters, an extensive private furnished balcony, individually controlled air-conditioning, private bathroom with bathtub, flat screen TV with international satellite TV channels, in-room safe, tea and coffee making facilities, hairdryer, and high-speed Internet access. Oasis Of Activity With its setting in Patong, Phuket's center of leisure, entertainment and beach life, the hotel is perfect for enjoying the town, with its enormous variety of entertainment and shopping activities. Mix Bistro is the hotel's all day dining restaurant serving Thai & International cuisines. The ground floor terrace at Mix Bistro host the VW Van Bar where cocktails and refreshments are served in a casual atmosphere. Operation Time: 06:30 - 23:00 hrs. Air Rooftop Bar & Lounge Located on the hotel rooftop serves snacks and refreshments at the edge of the pool. A snooker table, and entertainment and evening events are featured. Operation Time: 17:00 - 23:00 hrs. Type of Cuisine: A La Carte, Thai, & International Dishes is also available. Location: Available in all rooms Opening Hours: 06:30 - 22:30 hrs. Swimming Pool - Operation Time: 07:00 - 19:00 hrs. Fitness Centre - Operation Time: 06:00 - 22:00 hrs. After breakfast at Hotel. Full day Excursion to Phi Phi Island tour with speed boat + Thai lunch. (Cost included in tour) ** Not incl National park fee (Pls. be at hotel lobby five minutes before the given time for the prescribed tour) return back at around 1700 Hours. Lunch at Phi – Phi island. Dinner at Indian restaurant at your own. Board a regular cruiser or Express boat for the trip to Phi Phi Island, visit the Viking cave with its historic drawings and swallows nest before arriving on the island. Enjoy snorkeling, and lunch on the island. After breakfast at Hotel. Free time at your own. On time transfer to airport to board the flight for Delhi. 03 Night’s accommodation at Hotel in Phuket. 01 Thai Lunch in Phi Phi island. Arrival transfer from Airport –Hotel- Airport at Phuket on SIC.